This route leaves the Vesubie Gorge about 10km before it merges into the busy, unpleasant-to-cycle Valley of the Vars. This gentle ridge route descending into Nice is a pleasant alternative to the busy Vars valley, but not nearly as paradisical as the passes east of here. 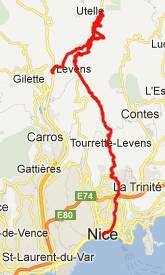 From North: D19 leaves the Vesubie Gorge in St Jean la Riviere and climbs up the west side of the gorge, in much the same manner that Col de la Porte does a few km upstream. After the settlement of Duranus the climb takes a break. Seeing the road ahead traversing a shelf on a massive opposing limestone cliff was by far the most interesting part of the route for me. But actually the reciprocal view, looking back to Duranus from the same road shelf is also a spectacular sight. After this the road keeps on climbing fairly gently and tops out on heavily populated plateau a little past the town of Levens. From South. A little past the highest point on this shoulder summit route is a large sports field (soccer field I suppose) with several affordable looking restaurants and hotels. I came down this route on a Sunday afternoon and the traffic was very heavy, nothing like all those enchanted passes to the east of here. It is probably not quite as bad during other times of the week. But there is constant stream of houses lining the road, really an outgrowth of Nice all the way up to Tourrette-Levens. The road finally descends at a uniform gentle grade, so that no breaking is required onto the socialized housing towers of St-Andre de la Roche - next stop is Nice.